A TRIO of Ponteland students got the chance to meet royalty following their golden achievement. Rachel Briggs, Mark Harrison and Katherine Twelves successfully completed a series of sport and skill activities, expeditions and community service over a two-year period to attain the Duke of Edinburgh Gold Award. 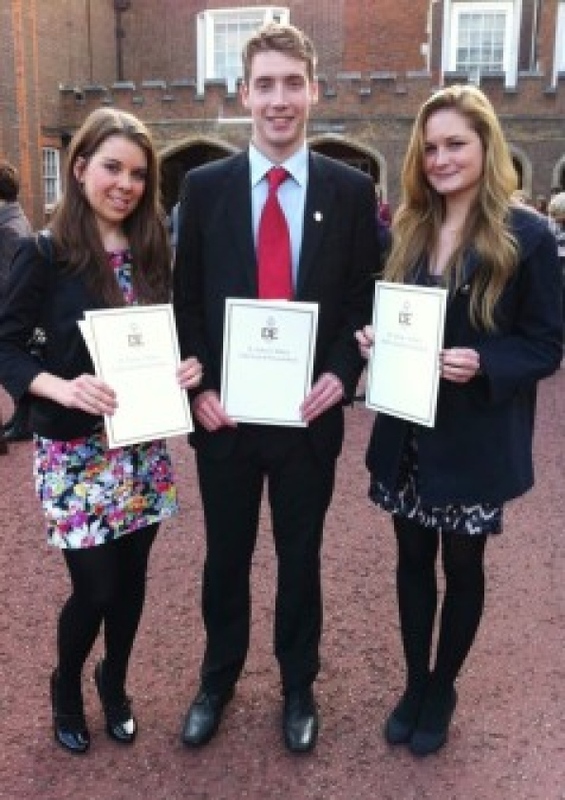 The university students, who used to attend Ponteland High School, were invited to collect their awards in the presence of Prince Philip at St James’s Palace in London. Mark’s expedition was in the Yorkshire Dales, which involved the group hiking eight hours a day for four days, camping out in tents and making their own food. He volunteered with the Ponteland cub packs through The Scout Association’s Young Leaders’ Scheme, for which he received a certificate, to meet the community service requirement and for the skill section he took up the drums. As for sport, the 20-year-old regularly plays tennis and has been a member of Ponteland Tennis Club for many years. “I enjoyed the Duke of Edinburgh scheme as it gave me the opportunity to do things I wouldn’t have done otherwise,” said the Darras Hall resident. “The expedition was tough at times, but we got into a rhythm and ploughed on each day and if anyone was struggling they would get support from everyone else in the group. “It felt great when everything was completed because achieving a Gold award takes a lot of commitment. “At St James’s Palace, all those who were getting their award were split into different rooms based on their region and we received ours in the same room in which Prince William and Kate Middleton announced their engagement publicly. Katherine, Rachel and Mark did their award through Ponteland Scouts, which runs the national scheme in the local area. Richard Walker, Duke of Edinburgh Leader at Ponteland Scouts, said: “To complete the Gold Award, young people have to learn a range of skills which they will find useful all their lives.